Life has a funny way of becoming too much to handle and sapping the "life" out of you. Doesn't it? I mean, just when I thought this new and incredibly busy way of life was doable- just when I thought I had it figured out and was something I totally had control over, BAM more was piled on. Busyness. Deadlines. Frustrations. Heartache. Changes. Exhaustion. There have been plenty a day where I sort of float through it- unable to really get my mind focused on any one thing. Plenty a night where I flop into bed and it's lights out for the hubbie, only to lay there sort of in a daze that lasts another few hours. I went to my book club a couple of Thursdays ago looking like a walking zombie. Either that or a cracked out crazy woman. I choose the zombie-esq description thankyouverymuch. Haha. The amazing women there all saw it, I mean my totally-thought-I-was-doing-a-good-job-applying mascara was indeed becoming under eye makeup, my hair was drooping (and filthy at that! Listen, having Italian in my blood, dirty hair is a no-go. It can go from luscious and shiny gloriousness to straight up oily mess making stink hair in a matter of seconds! ), my shirt had some stains, and every time it was my turn to share something I started with, "Uhhh...umm...yeah I mean....I...sorry, I'm just so tired!..." Things have gotten to the point of, what my husband and I like to refer to as, "cray-cray". I mean, I'm sure you all have noticed it too- this blog (my passion and creative joy) has seen better days. Posts are sporadic, content is lame (for lack of a better word), and I just can't for the life of me muster up a single ounce of strength to cook or bake something. It's been popcorn, pizza, and scrambled egg dinner for weeks now! Sheesh. Ok, I'm lying, last night I actually MADE dinner and it felt SooOOooOoOoo good! There's so much in my brain but when I go to type it....or talk it out for that matter, all that comes through are pieces of mumbles. I mean, really. It's like trying to push play-doh through a straw. Just isn't working. Not only that, but this amazingly wonderful blog that I've so anxiously and excitedly agreed to become a contributor of is literally sitting there wondering where I've gone. I'm just....out of it. My husband said it best when he told me, "Stress is the worst thing for creativity. It just saps all the life out of it". Amen to that. So for those things friends, I truly apologize. I'm so very sorry for the distance on my part. Here's the neat part. A couple of weeks ago God spoke to me in such a beautiful way. During a "very quick" run to pick up a canvas for my husband's upcoming art show we were just awestruck by the beauty of that night's glowing sunset. I mean, it was absolutely breath taking. Pictures just don't do it justice. So as we were headed back home, we stopped our car and sort of took it in (and snapped some photos...which seriously dumb it down so much). Be still, Christina. And know that I AM GOD. 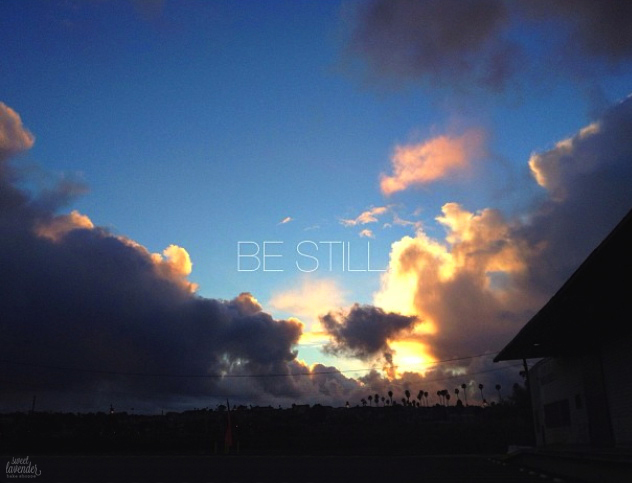 Not slow down, not take a deep breath, but be still. Stop. Stop moving. And know that I am God. This verse is no stranger to me. He speaks this to me a lot during troubled times. I had become a machine. Just going and going and going (I guess more like that darned pink battery bunny) and doing and doing and doing. Every morning started with a page of lists of things I HAD TO DO THAT DAY OR ELSE. I mean, I even had to write on the list, "Devotional Time" or else I'd forget. WHAT?!? And yes, the days I did indeed get to it, I crossed it off my list just like every other "task" I needed to do. I had lost that intimacy with God and instead replaced it with all my trillion "have to do nows" and heartache numbness. I don't know if you realize, but this is a command. It's not a suggestion. We are to NOT be anxious about ANYTHING but in EVERY situation, with prayer and petition and with thanksgiving talk to God about these anxieties. Give them to Him. ALL OF THEM. The best part? "And the PEACE OF GOD WILL GUARD your hearts and your minds in Christ Jesus." Boom. I can certainly use some guarding of my heart and mind right about now. It's in both those things that I find my anxiety and my stressors. My "to-do" lists exist there and in there my heartaches reside. So here it is, clearly written out and presented oh so lovingly- the most comforting breath of life. We are to remember to be still during trials and completely bonkers days. Why? So that in that stillness we can pray and give those very anxieties to Him. Maybe that means to literally stop and be still, maybe that means to be still in your worries and in your fears. That I don't know. For me, in that instance I needed to do both. I needed to literally stop moving, stop going, and stop my mind. I needed to take those things, everything holding me down and holding me captive, and hold them up to Him and simply say, "I need help Lord." Boy did I. So I did. And so I continue to do. When I find myself feeling like I've been swooped up once again in some crazy life tornado, I literally force myself to STOP, sit down, breathe, and pray. I make sure that in my devotional time I'm also mentally present. Ahhhhh, relief. Has life gotten easier? Not really. It's still going at ludicrous speed and throwing us some curve-balls. BUT, have I been a lot better? Absolutely. Slowly but definitely surely. I mean, I'm here writing a blog! And not just a "Hey look at this" blog, but like a meaty, making-you-think- bloggy! Praise God for that! Also, my husband and I have been able to laugh more and spend some more much needed time together- our eyes were opened to some changes that needed to be made for our well being (and honestly, mental health). Phew! Thank you for being here. Thank you for continuously returning to this bloggy and for ALL your love and support. I may be somewhat MIA for a little bit as we try and tie up some loose ends, blog posts might be incredibly sporadic for a season, but I will not be away too long. And (God willing) I'll have some neat things to share with you all. A very touching post. I stumbled across your blog and I am reading your past blogs. They are so fresh and fun to read.